OneKind I Our Policies I Zoos- are they suitable for wild animals? Zoos do not provide a natural environment for wild animals to live in, which causes them to suffer. OneKind believes that, as long as animals are kept in zoos, they should be tightly regulated. 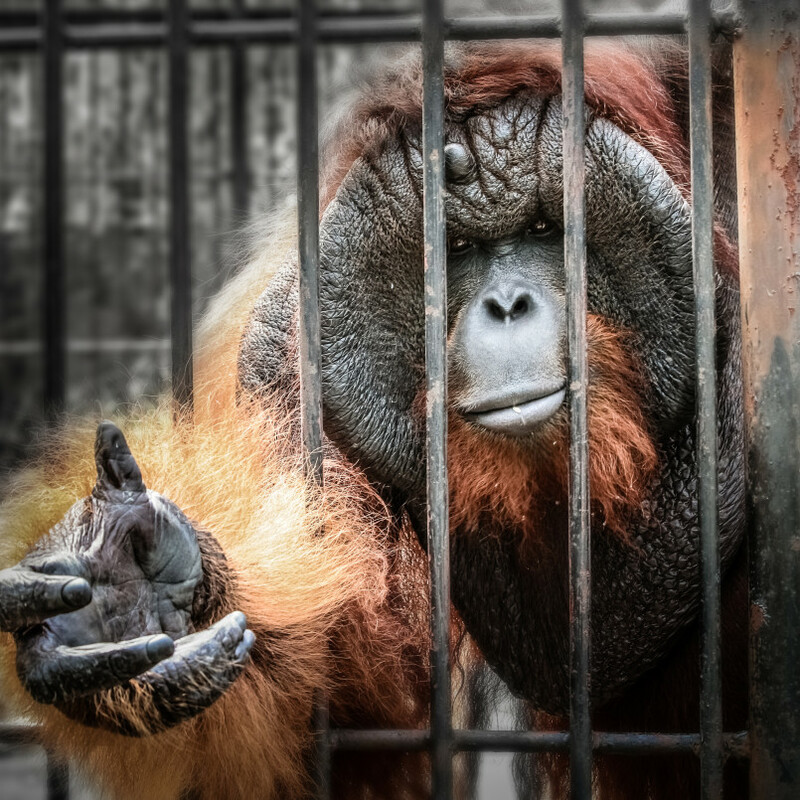 OneKind believes that there is no good reason to keep wild animals captive in zoos. Animals kept in zoos are confined in unnatural environments, often meaning they cannot perform natural behaviours. Stereotyped behaviours- those that are pointless, and repeated- are commonly seen in zoos. These behaviours include pacing, rocking, bar biting and head bobbing. For example, research has shown that, of 40 zoo-living chimpanzees studied, all individuals performed at least one abnormal behaviour . Zoos often cannot provide natural social structures for animals. Elephants are a prime example of this. Elephants are extremely social animals, forming strong relationships with each other. Such bonds are so strong that elephants have even been shown to grieve following the loss of a family member. Sadly, zoos often house these extremely social animals by themselves, or with just a few others. In 2006, 69% of Asian elephants, and 80% of African elephants in zoos worldwide were kept in groups of four or fewer . This, coupled with other factors, means that elephants held in zoos have a greatly reduced lifespan compared to their wild counterparts. A study has shown that the average lifespan for African elephants in European zoos is 16.9 years, compared to 56 years of those in the wild . It is not just elephants that suffer in zoos. In Scotland, 900 animals died in 2016 at sites (such as Edinburgh Zoo) owned by the Royal Zoological Society of Scotland. The animals that died include cotton-top tamarins, and a three year old koala called Yooranah, who was the first koala to be born in the UK . It is often claimed that zoos are necessary for conservation. However, most animals kept in zoos will never be used to increase the natural population. Instead, zoo animals spend their whole lives in captivity, simply for human entertainment. Furthermore, many species kept in zoos are not threatened in the wild . OneKind believes that, as long as animals are kept in zoos, they should be tightly regulated. Local authorities should properly enforce the EU Zoos Directive 1999/22/EC, particularly the requirement for ensuring that animals are kept in suitable conditions with high husbandry standards. Furthermore, inspections of zoos should be improved. Currently, zoos do not have to be inspected every year, which severely risks animal welfare.